Hand-made Original Canvas Painting - Not a Print. UV protective Glossy varnish (matte varnish upon request). 1 3/8" deep - painted borders for a contemporary look - no staples on the sides. Signature on front and back of the canvas (signature on front can be changed to fit any orientation - upon request). Certificate of Authenticity, hand-signed and embossed with the original CGUEDEZ logo. To Continental US and Canada, paintings of all sizes (except for Oversized Paintings) are shipped ready to hang, stretched, in a box and with all hardware included. For other countries, click on International Shipping Information. All Paintings for sale are available for immediate shipping and they usually take 2-3 business days to ship after payment is received and cleared. PO Boxes, APO, FPO or DPO are not accepted. We use USPS, UPS, FedEx, and DHL as carriers. Estimated transit time is 3 - 7 days for domestic (ground) shipping and 5-15 days plus your local custom's time for International Shipping (depending on destination). Insurance, tracking number and signature confirmation apply to all shipments. 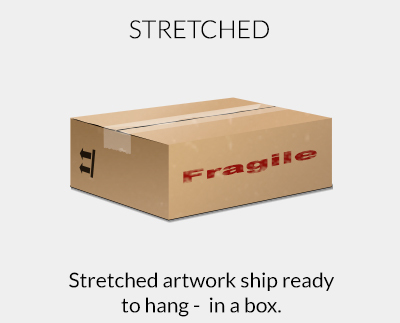 Paintings are professionally wrapped, cushioned, boxed and labeled. For information about how to display, preserve, handle and hang paintings, visit Fine Art Care Guide. For information about allergies, and other safe handling information, click on Safe Handling Tips. Taxes and duties charges are not included in the item price or shipping costs. Buyer accepts responsibility for taxes and duties costs. Calculate your estimated import duty and taxes using this tool (use for reference only). Check with your country's customs office to determine what these additional costs will be prior to buying. These charges are normally collected by the delivering shipping company or when you pick the item up. We do not mark the merchandise value below value or mark items as gifts, as it is illegal according to US and International Government regulations. North Carolina residents pay sales tax. Master Card, Visa, American Express, Discover and most Debit Cards are accepted. Secure checkout through Paypal. For information about returns, refunds and damaged packages, visit Return Policy. If you would like to have the painting in a different size or colors, I can create a similar base on your preferences. To request a custom painting, click on Commissions. To estimate the price in a different currency, click on Currency Converter. To convert the size of the artwork to a different lenght unit (ex: in to cm), click on Length Converter. Only one coupon code may be used per transaction. Paintings with "Promotional Prices" are not eligible for other discounts. Artwork with item #/SKU that start with PR (for ex. "Old Country", Item # PR00050 ) may not be eligible for coupons or any other offer. Paintings with a "Promotional Price", and a "Unstretched Canvas" messsage below the room view, will be shipped rolled in a sturdy tube. Paintings 48" x 36" (one single canvas) are considered "Oversized" by most carriers. Additional shipping charges may apply; unless they are shipped unstretched-rolled in a tube. Paintings over 48" (one single canvas) will be shipped rolled in a sturdy tube. Regardless its size, if a painting states Unstretched Canvas, it will ship rolled in a sturdy tube. Before purchasing a painting, please read Commom Issues and Safe Handling Tips. Mostly acrylics (professional grade) are used in all paintings. Some amount of pastels, oil paints, molding pastes, gels, mineral spirit, turpentine or turpenoid might be found on all paintings. Paintings are photographed with a high resolution digital camera to ensure accuracy. Images may not be to scale. Different monitors may display the colors of the photos slightly differently. All paintings and prints are stated in inches ("). 1 meter = 39.37 inches. Absolutely wonderful painting! We are more than HAPPY. Thank you! As an art collector, I have to say that your painting is amazing and is one of my favorites. Exquisite painting. It is absolutely flawless. Will buy from her again. High quality painting, just as expected. Thank you! Carmen ha la capacita di trasmettere belleza atraverso il suo conoscimiento dei sensi e i sentimenti. Il suo arte commuove, non e moda, e arte. Astounding quality. Arrived very quickly, packed very safely. Thanks. Muchas Gracias. El cuadro esta espectacular. Eres una excelente artista. ...the colors are beautiful, a perfect match to my living room. Picked up today. Fantastic Artwork! Thank you very much Carmen.